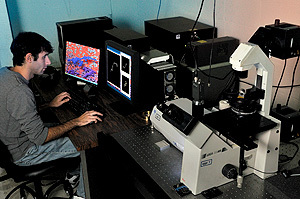 Five optical microscopes equipped with high resolution digital video acquisition systems capable of bright field, phase contrast, high speed, and fluorescence microscopy. 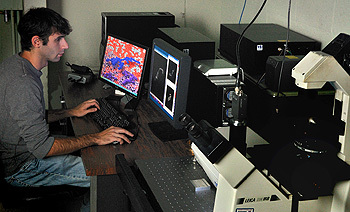 Three high-speed confocal setups, which can be used to study three-dimensional structure of materials, and biomolecular samples. 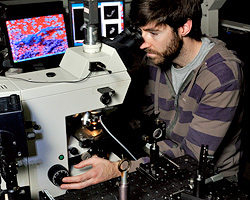 One holographic tweezer system based on a Zeiss Axiovert 135 employs focused laser beams to manipulate microscopic objects. A spatial light modulator can generate complex patterns, and enables three-dimensional manipulation. 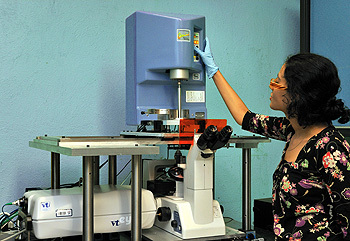 In addition to microscopy, the center provides other supporting optics equipment that is useful for characterization of soft materials. 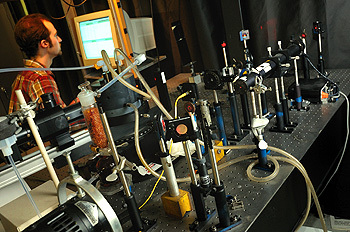 In particular, the center hosts a laser light scattering apparatus which is useful for angle-resolved static light scattering and photon correlation spectroscopy (i.e. quasi-elastic or dynamic light scattering spectroscopy). 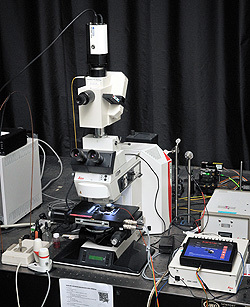 Upright light microscope, capable of bright field, dark field, polarization, phase contrast, fluorescence, differential interference contrast (DIC) microscopy, translational stage with position reader, and objective temperature control. 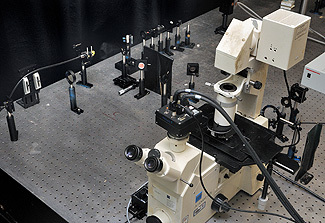 Upright light microscope, capable of bright field, dark field, polarization, DIC, and fluorescence contrast, fully automated with motorized stage (all three dimensions), and objective temperature control. Visitech QLC-100 Spinning Disk Confocal setup for confocal imaging with excitation wavelength of 532nm, from external CrystaLaser diode pumped crystal laser source. MetaMorph software for control and data management. Brookhaven Instruments, BI-200SM Capable of averaging, time-integrated intensity (classical), and intensity fluctuations (Quasi-elastic) light scattering measurements, temperature control from 5 ˚C to 80 ˚C with stability of ±0.1 ˚C, angle selection with 0.01˚ steps.